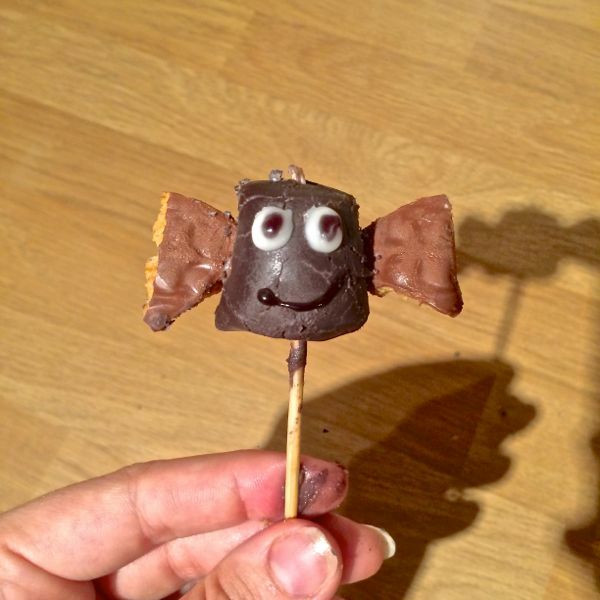 Halloween Marshmallow pops :: A spooktacular treat for kids in 5 mins. 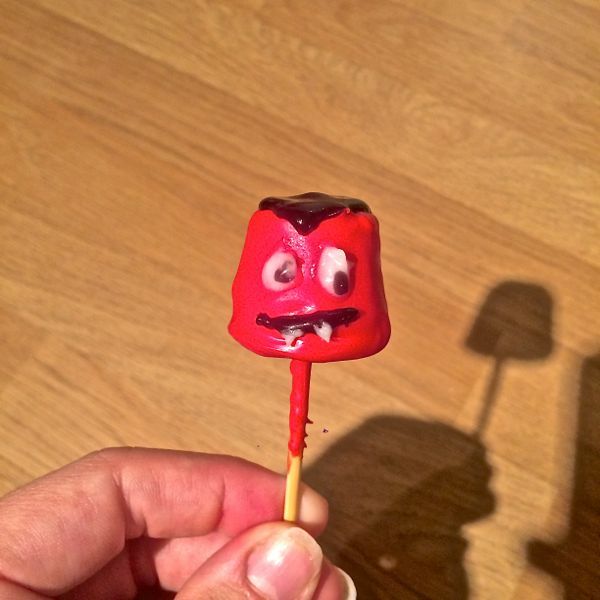 Last week I came across a really cute video of some Halloween marshmallow pops that were the cutest treat for kids this festive period. It looked really easy to do (don’t these things always) so I decided I’d have a go. I’m rubbish at these kinds of things but it actually wasn’t too bad! I did have a few things that I had to change to make it ‘work’ but they were from past experience with the ingredients. 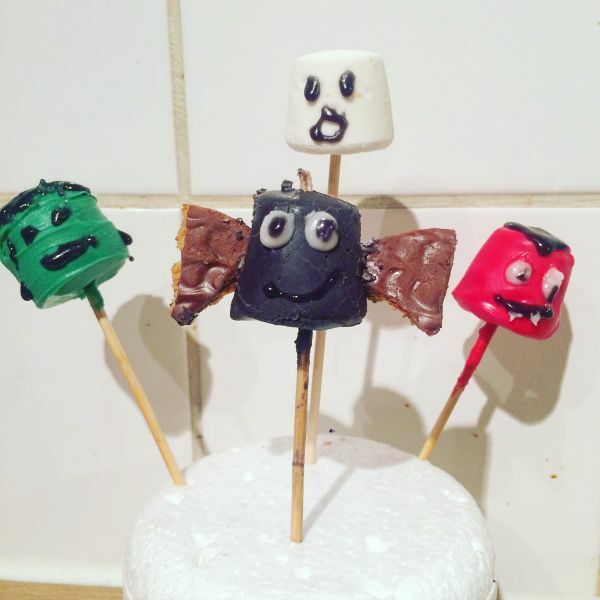 Here’s my attempt and how to make Halloween marshmallow pops for kids. 2 Oreos or digestive biscuits. Roo doesn’t particularly like Candy melts, so I made some ghosts without the coating and I just drew a little black ‘O’ with two black dots for mouth and eyes. Stick on the end of a stick and go! So easy, and he thought it was great. I used red candy melts for this because it’s all I had, but purple looks better I think. Melt the candy melts for 1 min in the microwave, stir, and if you need to go for another 20-30secs. I found it worked best if I did this in a cup (half full cup will make 4 marshmallows) because it gave me the depth to coat the whole marshmallow. I’d also recommend adding a tablespoon of oil to the candy melt mix because it loosens it, otherwise it’s a bit thick and pulls off the marshmallow. Put your marshmallow on a stick and dip in the candy melts, spinning around in the cup to cover completely. Then to get a smooth surface tap on the side of the cup repeatedly and twist the stick as you do. Leave to dry for a few minutes. Once dry, cost the top with black icing, pulling a v down the face, then two white dots with black dots inside for eyes, and a black line for a mouth with two tiny white fangs. 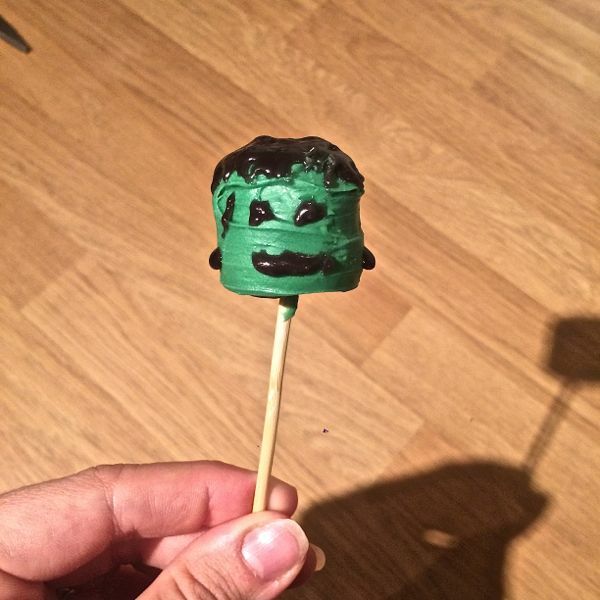 Frankenstein, or hulk as the boys said. Follow the same steps as a vice with the candy melts until you get to the decoration stage. 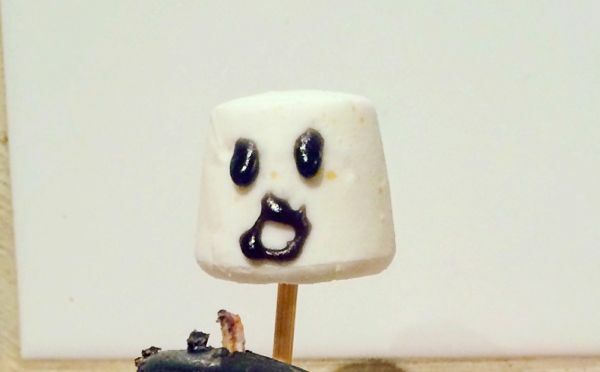 Spread black icing over the top of the marshmallow pulling it down into little flicks over the head. Then add two black dots for eyes, two black dots either side to act as Frankenstein’s bolts and a line for his mouth. Then a little black line for his scar. This was my favourite, but certainly not as easy as the video looks. Follow the steps above until decoration stage. To decorate you need to put two dots of white, with little black dots inside for the eyes and a black line for the mouth. Then, break up your chosen biscuit into quarters. Insert one quarter on one side, and one on the other. The only thing I can say is that the candy will crumble a bit, or it did for me, but it still looks the same, just not as good! It really was easy and so much fun. The boys woke up to find all the fun candy melts and they loved it! Previous Post Pumpkin Liqueur :: The best way to use up leftover pumpkin after Halloween! Next Post Pumpkin face mask :: DIY spa recipe using leftover pumpkin!